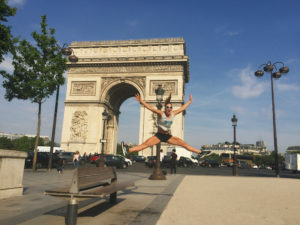 For the second installment of our series on Fit Vacations, we’re off to The City of Lights, Paris. Paris has forever associated with decadent food, beautiful architecture + historic art. All of that is accurate, but we decided to try and experience it through activity, rather than the typical lazy tourist route. We always like to have access to a kitchen when we travel, that way we have greater control over our food. We decided ditch the hotel + opted instead to stay at a residential apartment in the heart of the city. We used a company called Pelican Executive Suites who have several apartments for short-term rent in Paris (as well as many other locations). We were not disappointed, the place was great, had a good kitchen that allowed us to prepare fresh meals every day + had a fantastic location just off the Champs Elysee. Just like in Barcelona, we got our trip off to an active start by taking a bike tour of the city. It’s a great way to get a “lay of the land” of the place + make lists of where you want to get back to. We did the tour through FAT TIRE TOURS, they have a great website that provides details on all their tours + makes booking easy. We opted for the day tour, but based on conversations with others, we’d actually recommend the Night Tour in Paris. The Day Tour was still great though, we began the tour in the shadow of the Eifel Tower + visited many of the tourist attractions in Paris, we saw Les Invalides, Napoleon’s Tomb, Place de la Concorde, The Louvre, the Alexander III Bridge + ended the day with a picnic lunch in the Tuileries Gardens. The tour moved at a good pace + we enjoyed seeing the sights this way. Obviously we couldn’t go to Paris + not see the Eifel Tower but the thing we hate most is wasting times in lines. The line for the tower is always pretty insane but by skipping the elevators, you can save time + money. Its 300 stairs to the first observation deck and another 300 to the second, the top of the tower is not accessible by stairs, but you can take the elevators from the second observation deck (no line at that point). The stairs are quite a workout + our quads were definitely burning by the time we got to the second deck but the time saving was well worth the lactic acid burn. Even though Paris isn’t quite as bike friendly as Barcelona, it still has a decent amount of bike paths that make getting around the city fun + easy. Just beware, the drivers in Paris don’t particularly care for bikers and the will NOT yield right of way. The city provides a bike rental system called Velib where bikes are stored at automated spots all over the city, you walk up, rent a bike + then have it for as long as you like…except that they charge by the minute for rides longer than 30 minutes…meaning that you basically need to change your bike out every 30 minutes or it starts to get expensive. We tried this system but found it restricted out movement too much + kept us looking for bike stations every 30 minutes…FAIL. So we ditched the Velib system + went back to Fat Tire Tours + rented bikes from them for the remainder of our stay. They were well priced + came with lights + bike locks. 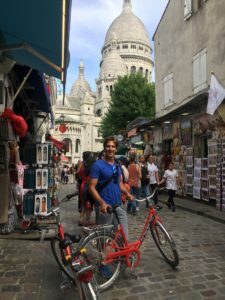 We still had sights to see that were not on the bike tour so we planned out a route that took in the Moulin Rouge enroute to Sacre Coeur. This ride while only 4 miles was actually really difficult on these 3 speed bikes. The road to Sacre Coeur is uphill all the way and at abut a 20 degree incline over cobbled streets. Its well worth it though as we really got to appreciate the different neighborhoods + the scenic architecture while riding. The views from the top are also breathtaking, you can see the whole city. After that ride, we needed a break so we rode back to the apartment and cooked up a fabulous lunch with some fresh groceries we picked up on the way. Paris isn’t called the “City of Lights” for nothing, it truly is spectacular after dark, from the beautiful architecture being tastefully lit to the spectacular Eifel Tower light show, the city really is a sight to behold at night. We took full advantage of that by doing a nighttime ride along the Seine. The locals flock to this area around sunset to enjoy the outdoor cafes with a bottle of wine, it’s truly a must see. The only downside is the locals are still in denial about lung cancer apparently + the area is engulfed in a thick smoky haze…not cool. We rode all the way down to Notre Dame Cathedral, a nice long ride that can be done at decent speed as the bike path easily navigable. Notre Dame is stunning at night, the way it is lit up really does give it a cool factor. Right next to Notre Dame is the trendy Latin Quarter, with great restaurants + bars and lots of hilly streets to navigate. We had a blast riding around the hills + grabbing a bite to eat and drink in the trendy bars. The final stop of our Fit Vacation Paris was the Palace of Versailles, an easy train ride from the center of Paris, skip the Uber, its so much cheaper + easier on the train. Once at the Palace, we recommend heading to the gardens upon arrival, most people que for the tour immediately + you’ll be waiting for hours. The gardens are spectacular, huge + the perfect playground for a workout. We jogged along the tree lined roads, ran up + down stairs while taking in the natural wonders created by King Louis. We also got an upper body workout by renting one of the row boats that you can rent to row around the gigantic Grand Canal. We also recommend brining a picnic lunch with as the gardens are a perfect place for an al fresco meal. 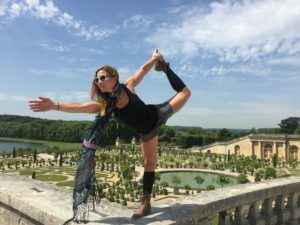 All in all, while not quite as health + fitness oriented as Barcelona, Paris can still be enjoyed and keep you fit at the same time. Just be wary of the clouds of smoke from the less than friendly locals. Travel safe and stay fit.